Nagpur : All batsman of South Africa have been bowled out for an embarrassing score of 79 in their first innings against India on Day 2 of the third Test at Nagpur. Ravichandran Ashwin was the srat of the show as he picked up his 14th five-wicket haul. India now have a lead of 136 runs. Dean Elgar was the first to go in the the final ball of the day’s first over as he played on a delivery from Ravichandran Ashwin for 7. South Africa then lost their skipper Hashim Amla for just 1, while he was attempting to sweep, again falling to Ashwin. In the very next over the visitors lost their best player AB de Villiers for a duck as he scooped one back to Ravindra Jadeja, who picked up his first wicket of the day. adeja and Ashwin were doing all the damage, but skipper Virat Kohli decided to introduce Amit Mishra into the attack and it worked almost immediately, Ishant Sharma was not required to bowl today at all. South Africa began the day on 11 for 2, with Amla and Elgar at the crease, after India were bowled out for 215 in their first innings, with Murali Vijay top scoring with 40. 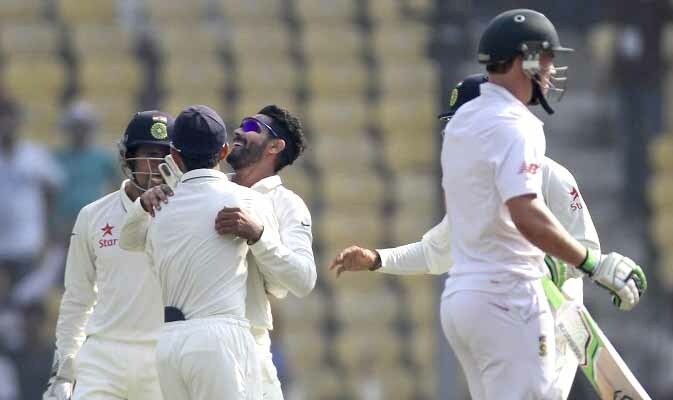 Jadeja and Wriddhiman Saha scored 34 and 32 respectively. Simon Harmer and Morne Morkel shared 7 wickets between them, which ensured India do not get a huge score on the board. On Day 1, India won the toss and elected to bat first. India have roped in Rohit Sharma in place of Varun Aaron. Also, Stuart Binny was dropped to the bench and Amit Mishra was given an opportunity. Harmer came into the South African side in place of Kyle Abbott. South Africa : 79 (JP Duminy, Simon Harmer 13, ; Ravichandran Ashwin 5 for 32, Ravindra Jadeja 4 for 33) 136 runs.